The inspiration for this dreamy crepe de chine top came from our bestselling Riverside dress. We took the same dropped shoulder, boatneck, and relaxed fit you love, and we cropped it to high hip so you can wear it with virtually any bottom. Made in NYC. Loose fitting, flowing top. Length hits at high hip, with a straight hemline, allowing for wear untucked or tucked in. 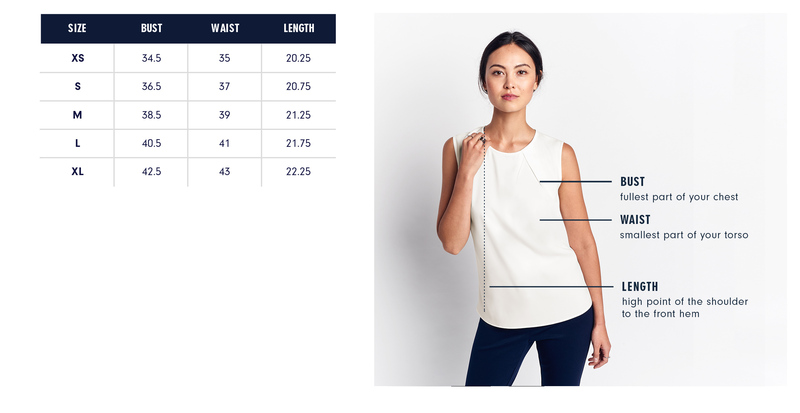 Our model is 5’10” and wearing a size S.
Exact measurements of the Lawrence Top below. All measurements are in inches. For general brand fit, sizing, and measurements, please visit our Brand Fit & Size Guide. Care: Machine wash cold, lay flat to dry. Do not tumble dry. Loose fitting, flowing top. Length hits at high hip, with a straight hemline, allowing for wear untucked or tucked in. The inspiration for this top came from our best-selling Riverside Dress. Featuring the same dropped shoulder and relaxed fit as well as a carefully placed hemline for effortless wear with any outfit.